Back when stamping was young, handmade envelopes were pretty common. 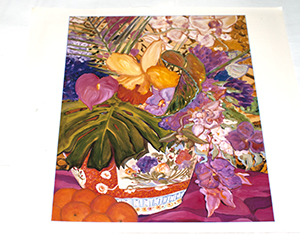 While you can purchase decorative paper or use a large piece of paper and color and stamp it, a popular decorative paper source among stampers has always been colorful calendar pictures. 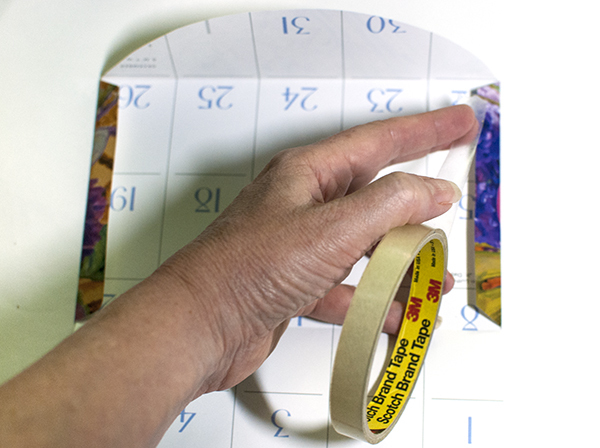 Use the calendar and then save the pictures to cut up into envelopes later. 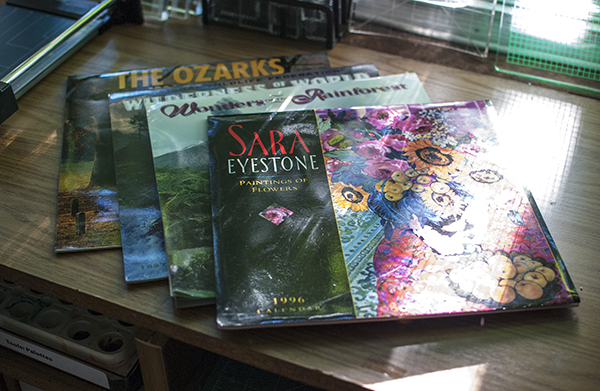 As I’ve been sorting through my stamp area recently, I came across a stash of calendars from the 1990’s that I had saved but never used for envelopes. Time to cut them up! This particular calendar has pictures that don’t fill the entire calendar page. 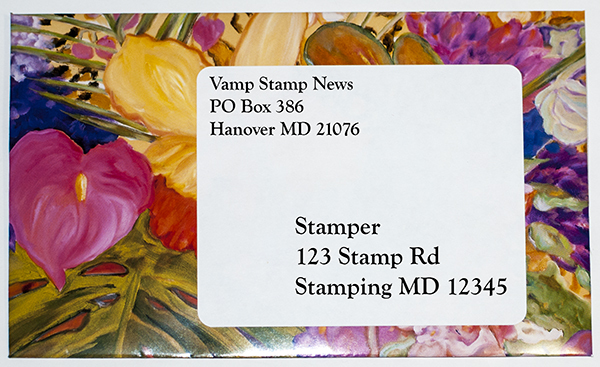 But that actually works out well because it means that the whole picture area will wind up as part of the envelope. It doesn’t have to be this way of course. 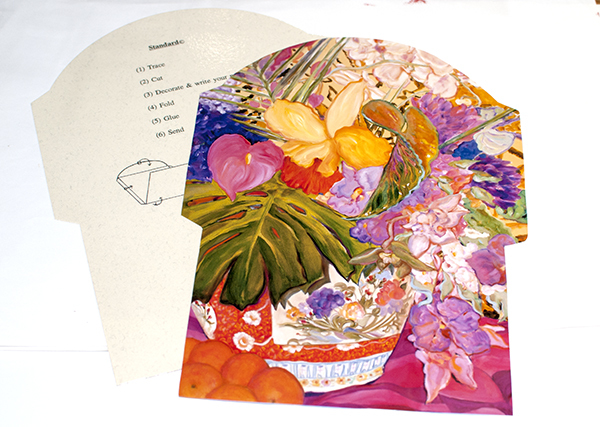 But you do want to think about the envelope style and where the picture elements will wind up on the envelope. On the front? The back? Sometimes pictures with an overall design or landscapes are easier to work with than images with a focal point image that you want to line up in a particular spot. Then you just cut along the scored lines. 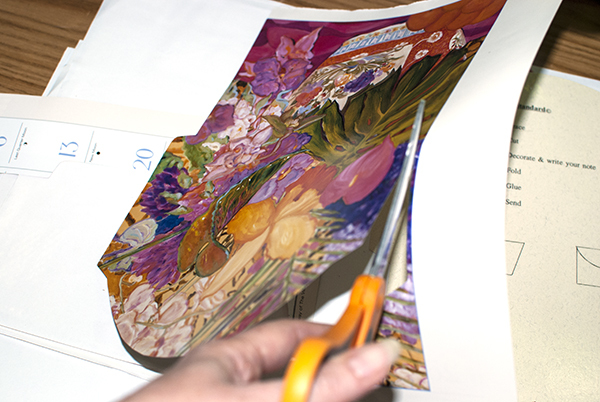 Most envelopes have fairly simple lines so it is a quick process. You could just fold it, but you’ll get nicer, crisper folds if you score the folds first. 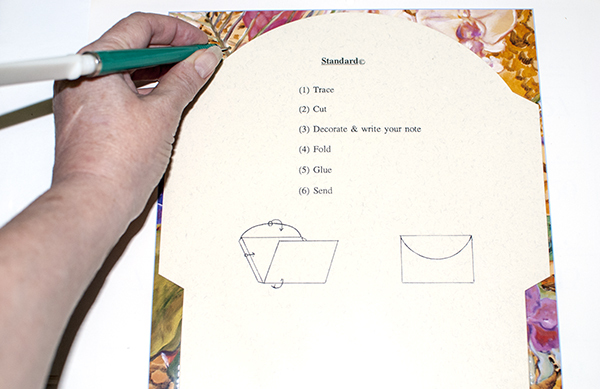 Some envelope templates have slots cut into the template to allow you to score when the template in place. This template did not but the fold lines are obvious and easy to line up with a straight edge. Four quick scores and the envelope is ready to fold up. A lot of people like using glue stick for envelopes, but I’ve never been a glue stick fan. After too many years of receiving cards constructed with glue stick in pieces, I don’t trust the stuff. If you use fresh non-dried out glue stick on light paper and burnish it well, it is probably fine, but I want put a few unmounted stamps in these envelopes and the surface is slick. I want them to stay closed and well-sealed, so I went with some sturdy double-sided tape. 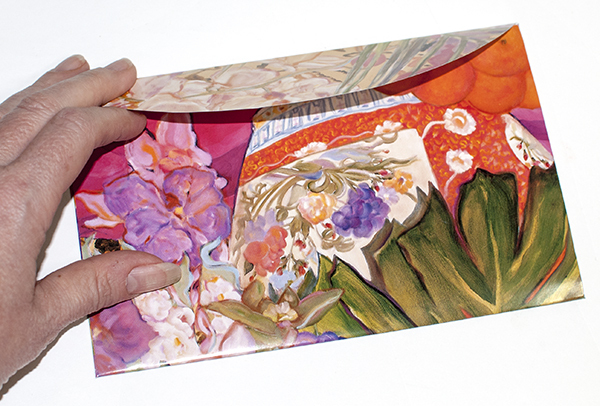 You can buy “Lick & Stick” envelope glue from Green Sneakers (who also makes some great envelope templates that don’t even require scoring or cutting –you simply tear and fold. How cool is that?) For my envelopes made of slick paper which will hold unmounted stamps, I’ll seal them with the double-sided tape too. They should stay closed but still be easy to open with a letter opener. 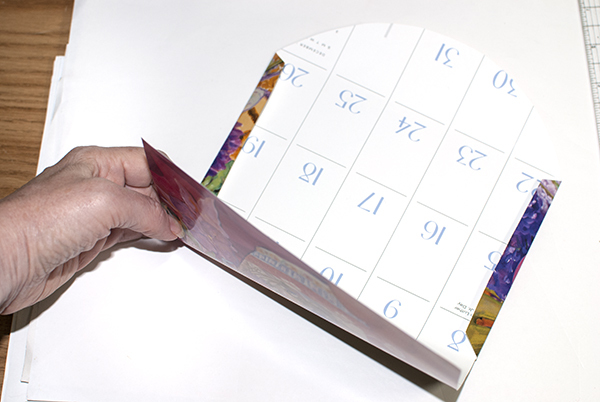 One thing to keep in mind with slick calendar pages is that the type of postage stamp that you lick can slide off of slick surfaces. Either rough the postage area up slightly or use the sticker type of postage. Use a white sticker to address the envelope too so that the post office machines can easily read the address. This process is so darn easy. 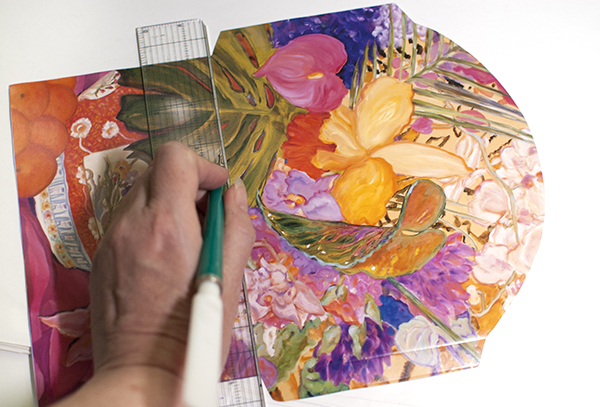 If you don’t have an envelope template, you can take apart an envelope you like and trace around it. Of course, if you have a die-cut machine and an envelope die, you might just use that to cut the basic shape. This is a great way to use up old calendars, pieces of extra wrapping paper, decorative shopping bags and big pieces of paper you put under cards you are working on that get covered with interesting colors, textures and designs. Do you have an envelope template or die? When is the last time you used it? ← New Goodies on VSN Stamping Yardsale! how can I get the template ? Have a few templates to use, but weakened and got the new ‘Envelope Punch Board’…sure is slick!!! That’s not to say the other templates I have are not good…this is just way quicker – LOL! I just received the 8 back issues that I won from the eArticle drawing, and the absolutely beautiful handmaid envelope you made containing a stamp I ordered. Thank you. The envelope is a “keeper” definitely. This post and envelope have got me interested in taking out my odd pieces of wrapping paper and getting to work on making some envelopes too. The odd pieces were just sitting in a drawer without being previously useful!